What is it with Friday's and these celebs being so "kray-kray"? 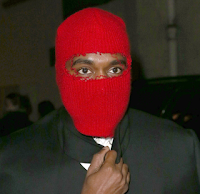 Last week I posted a photo of "rapper" Kanye West wearing what looked to be a homemade red ski-mask. Probably something his intern or his baby mama Kim Kardashian put together for him. At first I threw all the shade at him for this but after checking weather.com and realizing that it was cold as hell in Paris .. I see that ski masks were necessary that day. So I turned the shade down and stopped judging... but I did wonder why the ski-mask wasn't bedazzled. 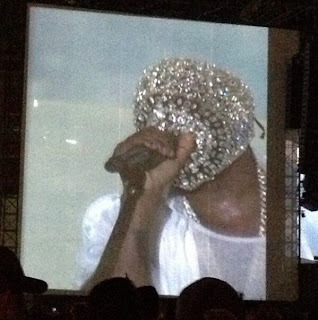 Lo and behold, this morning the Internet starts spitting out photos of Kanye performing in Abu Dhabi wearing a blinged out face mask, a feather rabbit/bunny looking head gear, and a straight-jacket. I guess I have to get up on my high-fashion because oh hell.. what happened here? I did call it with the blinged out face mask. But, I don't know if I'm happy that he followed through. The straight-jacket is a gimmick done many a times but the blinged out face mask is new to me. 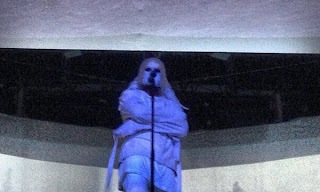 Someone posted a really bad video clip of Kanye at a concert in Abu Dhabi. You can watch it by clicking here if you like but it's long (13min), very shaky, and he's ranting and using an auto tune device. In the words of Sweet Brown "ain't nobody got time for that." 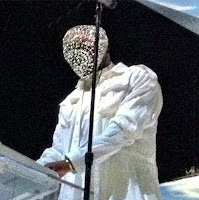 Kanye may need to take a seat very soon or at least when his baby is born. What a way to start off Black History Month. 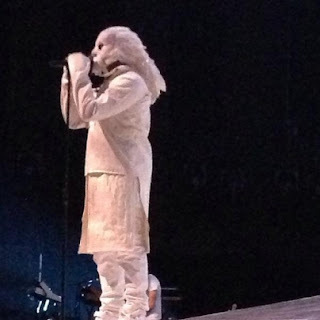 I really think he needs to go back to dressing normal again and leave all of the crazy clothes to his girl Kim.